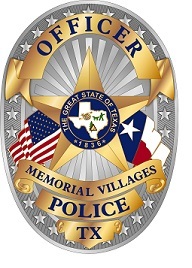 The Memorial Villages Police Department was established by the cities of Bunker Hill, Hunters Creek & Piney Point in 1977 as a common municipal police department through the "Texas Interlocal Agreement Act". Each contracting city appoints a Police Commissioner and an Alternate Police Commissioner to the Board of Police Commissioners. The Board of Police Commissioners supervise and administer the provisions of this Agreement and the affairs of the agency. The mission of the Memorial Villages Police Department, in partnership with the community, is to uphold the Constitution of the United States, enforce Federal, State, and Local laws, as well as protect the fundamental rights of all people. We strive to link the latest technology and proactive techniques to prevent crime to the greatest extent possible, while aggressively investigating crimes and apprehending those who commit them. We strive to constantly improve our standing within the communities and meet or exceed their expectations, through hiring and retaining the highest quality of experienced professionals who demonstrate a commitment to the highest level of professionalism and integrity. The vision of the Memorial Villages Police Department is, through partnership with our communities, to provide a safe quality of life for our citizens through proactive policing and aggressively investigating crimes against our community. Honor – The foundation of our character. This is the quality that defines who we are, always maintaining the ultimate in ethical and moral behavior. Integrity– Our unwavering fundamental value that is built on honesty and trust. Service – We are committed a service based approach to protecting our community.